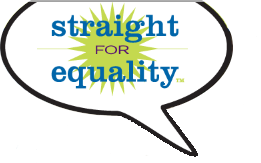 Straight for Equality is a program of PFLAG National designed to invite, educate, and engage allies in the movement for lesbian, gay, bisexual, transgender, and queer (LGBTQ) equality. We like to think of allyship as a journey - one that is shaped by our diverse personal experiences and backgrounds and that no matter where that journey begins, we all have the potential to be allies to people who are LGBTQ. While for some people, being an ally feels like a title that's been with them forever, most allies have a journey to being more supportive, taking action, and owning their role as an ally. Some may be inspired to take the ally journey because of a specific event -- a friend or co-worker coming out to them, for example. Some find that it is just learning more about an issue, like the experiences of LGBTQ youth, that inspires them to learn more and get involved. Others may simply feel as if being an ally is the right thing to do. No matter where you are on your journey or what motivated you to get involved, figuring out where you fit onthe Ally Spectrum will help connect you with resources, tools, and support to move forward, continue your journey, and become a great advocate for equality. A New Ally is someone who wants to learn more about the issues that affect the LGBTQ community and would like to overcome their own challenges when it comes to talking about these issues or barriers that keep them from taking action. New allies want be supportive of the people who are LGBTQ in their lives but are not always sure of how to do it. An Everyday Ally is someone who is comfortable with LGBTQ issues but feels like they could always learn more. Everyday Allies will take action when they hear something inappropriate or speak up when they hear misinformation about people who are LGBT but are often on the look-out for more effective ways to support their LGBTQ friends, family, classmates, or coworkers. A Super Ally comes to the spectrum, Pride flag in hand, and is a powerful advocate for change personally, socially, and sometimes even politically. Super Allies often don't shy away from the politics or the debate, are part of LGBTQ organizations in their communities, and are always looking for new ways to fight for equality. Use the books, movies, and resources in this section to expedite your own ally journey. And remember, no matter where you fit on the ally spectrum your contributions are meaningful and important. Forty-five years of experience has taught us that no two allies are the same and that there is no "right" way to support fairness and equal opportunities for all people. Regardless of what brought you here, wecome to the Straight for Equality Ally Spectrum!